The Customer Marketing Tool is getting a facelift this quarter. We're updating the dashboard and providing more information about how our pre-made templates work. We're investing time in social media, expecting that more social media interaction will bring more repeat visitors to Bonanza. Sellers can now submit listings for consideration for an Instagram feature. We're also running a social media contest, where customers share posts of themselves wearing shirts bought on Bonanza using #BonanzaTees for a chance to win a Bonanza gift card. As mentioned above, our team is developing more precise methods for predicting the seasonality of our top-selling categories. We’ll share this information with sellers throughout the year so you can strike while the iron is hot. The Customer Marketing Tool will also have seasonal templates coming soon. Be on the lookout for emails and site banners about which categories are currently thriving. Most survey respondents said that creating and maintaining listings takes up the bulk of their time. Last year, we took a few small steps to help reduce this time spent, like refining our tooltip information on the item listing form. We also simplified the shipping section of this form, and are working on modernizing the code on the backend to make it easier to maintain and update in the future. Additionally, we have plans to make the batch editor faster and easier to use. Most sellers asked for improved reliability of inventory synchronization with other marketplaces. While synchronizing with other marketplaces can be challenging, we want to find ways to make improvements where we can. Key areas include exploring ways to reduce duplicate listing imports and decrease image importing time. These changes will make cross-platform inventory syncing a more seamless experience. We've received feedback from sellers that our site search has been inconsistent. Sometimes items don't seem to show up for related keywords (or irrelevant items show up instead) and filters don't always work as planned. We have plans to fix these bugs and make site search more dependable. We also spent time last year improving site search on mobile devices. We redesigned search to be more usable on mobile devices and adjusted the navigation menu on mobile devices to allow for more direct browsing. Refining a search works the same on all platforms now, giving buyers many more options to sort and filter. Buyers are an important part of our marketplace, so we also ask for their feedback to help guide our initiatives. One of the most common requests we receive is for an easier way to manage order issues. That's why we created the Bonanza Order Resolution Center. This new feature allows buyers to file disputes directly through Bonanza when their order was significantly not as described (SNAD) or when the item was not received (INR). This will not change how sellers respond to and manage PayPal cases. Additionally, sellers still have access to the same seller protection benefits provided by PayPal. Why did you create the Bonanza Order Resolution Center? Roughly 20% of negative feedback received by our support team is related to the confusing nature of the dispute process. We believe that this feature will build trust in the marketplace, increase repeat customers, and drive future sales. Making it easier to file disputes? How will this help sellers? We understand your concern. By creating a seamless order resolution experience, we're facilitating buyer confidence and trust. Bonanza will continue to encourage buyers to contact sellers directly to resolve their issue before filing a dispute. If a buyer does file a dispute, PayPal's regular standards of evaluation still apply. A valid reason is still needed to win the case, and the decision for a case is still made by PayPal. Does this mean that Bonanza’s support team will now be able to influence PayPal decisions on cases? No. PayPal remains the final arbitrator in evaluating a case. Our support team will now have better insight into the details of these PayPal cases. We'll be able to help monitor cases and assist with communication between parties. With a more complete picture from both sides, our support team may even be able to help prevent dispute escalations. Does this affect the way buyers handle issues with payments made through Stripe or Amazon Pay? No. Buyers who paid through Stripe or Amazon Pay will continue to file cases directly with those companies. This Resolution Center will processes PayPal disputes only. Our team hopes to expand to other payment processors in the future. If you’d like more information about this new tool, visit the Bonanza Order Resolution Center help page. You've probably heard about Bonanza Webstores before. Just in case you haven't: a Webstore uses your booth inventory to create a standalone website. Webstores are separate from the Bonanza marketplace, giving you your own branded ecommerce site. Sellers have long asked for a way to select which booth items are available in their Webstore. Some sellers have items that only need promotion during certain seasons. Others want a way to differentiate their Webstore brand from their booth. Giving sellers more control over selling is one of our top goals. 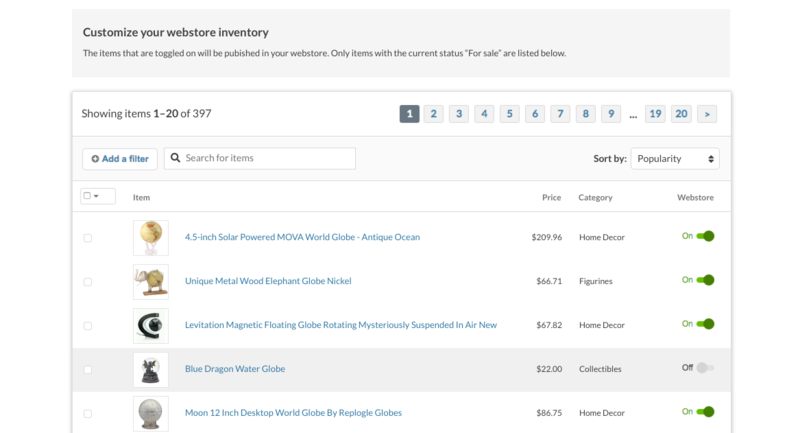 Now, sellers with active Webstores can now customize their Webstore inventory! The default setting for Webstores is to publish all active booth items. To edit your Webstore item inventory, go to the "Basic Settings" of your Webstore and select the "Manage Items" tab. From there, you can use the controls on the righthand side of the table to toggle items on or off. This functionality adds a layer of customization that will make Webstores a more universal tool for all sellers. We can't wait to see what this new quarter brings! Thank you for being a part of the Bonanza community. Because this is a new blog series, we'd love to hear what you think about it. If you have constructive feedback or ideas on how to improve these quarterly posts, please share in this 3-question survey.